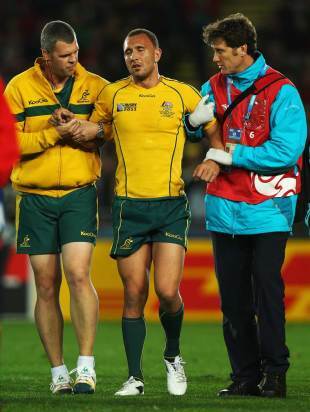 Australia's crocked fly-half Quade Cooper faces up to six months on the sidelines after rupturing an anterior cruciate ligament during the third-place play-off win over Wales. The mercurial fly-half went down in a heap after his right knee buckled beneath him as he looked to run at the Welsh defence. The 23-year-old limped off the pitch after 22 minutes and he is now expected to miss Australia's short northern hemisphere tour later in the year. The news follows a difficult tournament for the New Zealand-born Cooper, who has been a target for the Kiwi press throughout the global gathering. The Queensland Red, who moved to Australia as a 15-year-old, courted controversy earlier this year when he allegedly kneed All Blacks captain Richie McCaw in the Tri Nations - an incident that has not been forgotten by the country's media. Despite his difficulties,Wallabies coach Robbie Deans believes the talented playmaker will return far "stronger". "Quade is aware that it is a significant injury, but with technology these days he will come back good to go," Deans said. "Obviously that whole experience, that adversity, will challenge him, but I have got no doubt he will come out of that stronger for it." Cooper's half-back partner at club and international level, Will Genia, believes the wounded No. 10 will benefit in the long-term from his trials and tribulations. "In terms of his character, he showed a lot of guts and a lot of character. He'll be much better for it," Genia said. "Obviously the way he finished with that injury is disappointing, but he'll come away a better person."